Lewis Hamilton said he is "grateful" to be in the fight for what has become an increasingly close title race after winning the Italian Grand Prix. The McLaren driver moved from fifth to second in the standings to trail leader Fernando Alonso by 37 points. Hamilton, 27, told BBC Sport: "This championship has been so unpredictable. I'm so grateful we're in the fight, we have a good car and we can compete. "The car's not necessarily the fastest, but we're as fast as our rivals." With Sebastian Vettel and Mark Webber of Red Bull and McLaren's Jenson Button failing to score, Alonso extended his lead in the championship following his rise from 10th on the grid to third at the finish. But with Kimi Raikkonen of Lotus netting another strong points finish in fifth, it means just two points separate Hamilton in second, Raikkonen in third and Vettel in fourth. Webber is only eight points further back. "[The win] is great for the championship," added Hamilton. "It just shows that anything can happen. I've had some real bad races and some good ones - and I hope some more good ones are coming. "We've had some great performances in the last few races but I've not picked up points in all of them so I need to improve on that area. "It's going to be incredibly tough. Fernando let the cat out of the bag and said they've got lots of updates coming to the next race [in Singapore]. "I'm going to go back to the factory and hope that the guys are doing the same - I trust they will be. There are seven more races to go so this is just one step." Vettel, who was second in the championship coming to Monza, was philosophical about his title hopes despite failing to reach the finish for the second time this season. "We lost some points today," said the reigning world champion. "It doesn't help if the others are finishing and we don't. We did the best we could." Ferrari boss Stefano Domenicali reiterated that with 175 points still on the table, and 47 separating the top six, the title was still wide open. "I have to respect all of them [the rivals]," he said. "I always said Kimi is a dangerous driver and he is getting closer and closer. For sure Hamilton, with the car he has now, is very strong. All the drivers in the top five or six need to be taken seriously." Championship leader Alonso said that he was unsurprised to see Hamilton become his closest challenger. 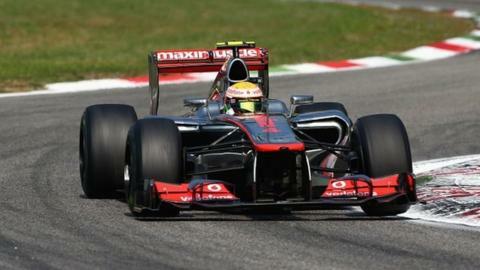 "McLaren has won the last three grands prix and they are in top form. I think from Jerez they won [had the fastest car] in winter testing. "Who was the driver that I respect more [then]? That was Lewis and we're still here, 11 or 12 races afterwards - we are first and second in the championship. It will be tough until the end." Button arrived in Italy on the back of victory in Belgium but trailed Alonso by 53 points. That gap has grown to 78 - more than three race wins - with seven races remaining. "It's not good," said Button of his title hopes. "Today's result shows you that if you can be consistent, you have a chance of winning the championship. "At the moment for me, it's 25 points one race, none in the next. I'm a long, long way off but I feel confident in my team and my ability to fight for wins. At the moment that's all I care about."